Secondly, this cake isn’t going for any beauty awards. It’s beauty is in the rustic, this-must-have-come-from-mom’s-kitchen look. And while I love a beautiful cake as much as the next person, I adore these decidedly un-pretty ones because they take the pressure off presentation. I hope you find yourself enjoying a slice of chocolate cake today! Preheat you oven to 350 degrees. While the oven preheats, grease and flour a 9×13″ pan. Set aside. In a large bowl, whisk together the flour, sugar, cocoa, baking soda, baking powder, and salt. Beat in the eggs, milk, oil, and vanilla on medium speed. After two minutes of beating, add the boiling water and stir until incorporated and runny-looking. Pour into the prepared baking dish. Bake for 35-40 minutes, until a knife comes out clean. Let the cake cool for 5 minutes, then poke holes all over the top using the handle of a wooden spoon. Place the chocolate chips in a glass (or other heat-proof) bowl. In a double boiler, bring the sweetened condensed milk to a boil. Pour the boiling milk over the chocolate chips. Let stand for 30 seconds, then stir until smooth. Immediately pour over the cake, smoothing into the holes as much as possible. Let cool at room temperature for an hour, then move to the refrigerator to cool completely. When the cake is completely cooled, make the frosting. In a stand mixer, or using a hand mixer, whip the heavy cream until soft peaks form. Add in the powdered sugar, cocoa powder, and vanilla, and continue to beat until stiff peaks form. 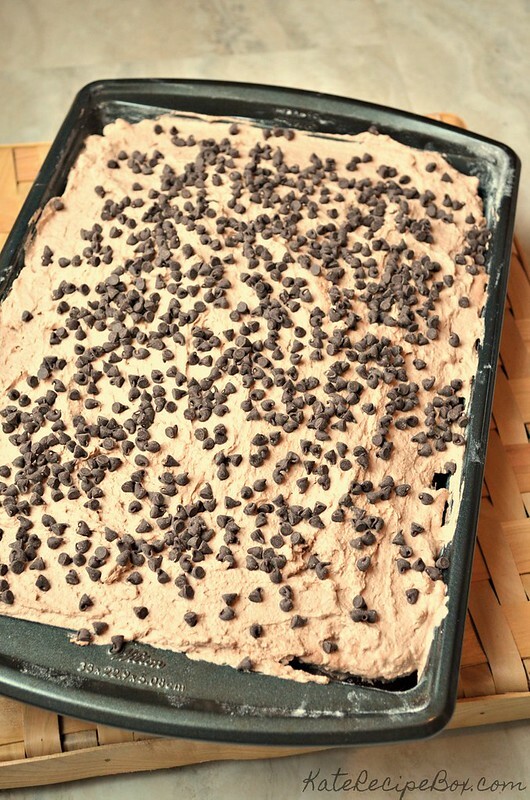 Spread evenly over the cake and top with mini chocolate chips. Chocolate decadence galore. 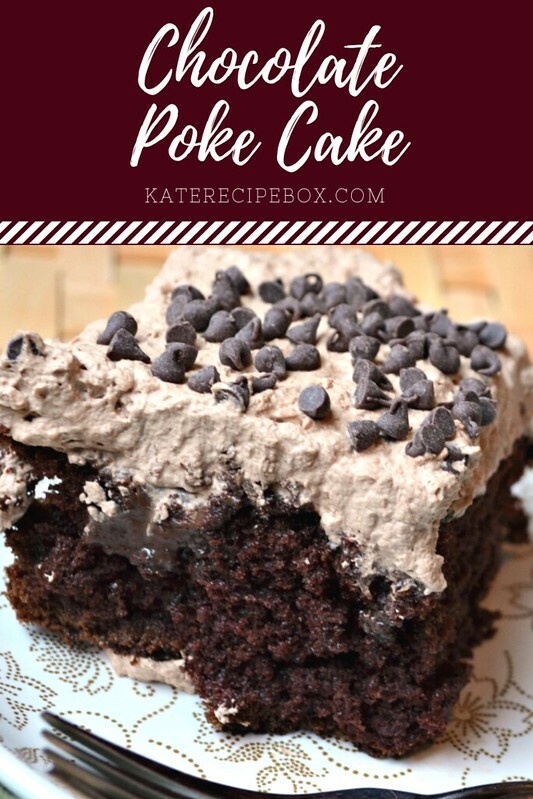 I have never had, nor made, a poke cake. I’m intrigued. 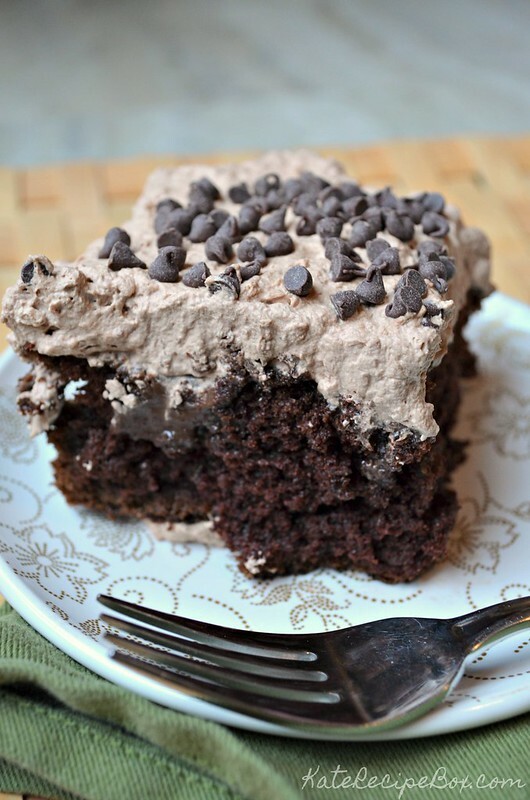 Chocolate cake is my BFF too! lol Yours sounds so good!